You want to make sure that your home is safe when you put it on the market and have strangers touring your property. As a real estate agent, it is my goal and my top priority not only to sell your house but to keep it safe during the process. #1. Make sure you leave when there is a showing. It's always in your best interest not to be present during the showing and it's also a good idea to take your pets with you. (This is a necessarily mean aquariums or large cages but more along the lines of cats or dogs.) also, don't let any buyers and that are not accompanied by their agent. If some random person off the street wants to see your property have them contact your real estate agent and make an appointment. Yes, you may miss out on a showing but it's better to be safe than sorry. #2. Keep personal belongings and valuables locked up. Because you are not home during a real estate showing buyers will be more inclined to look through drawers, cupboards, cabinets, and closets. Anything that you don't want out in the open should be locked up or tucked away in a well-hidden spot. This means jewelry, passports, money, or any personal, private documents, bills and information. i.e. don't leave your credit card statement tacked to the refrigerator, etc. #3. If you are home during the showing, make sure you don't box yourself in. If for some reason you are going to stay during a showing, don't box yourself into a corner room without an escape exit. Be careful when speaking to potential buyers who may try to extract verbal agreements from you that you're not ready to answer. Any and all mediation should be done through your real estate agents. #4. Contact a friend during the showing. While it's a good idea to leave the home during a showing, many sellers simply get in their car and go around the corner to wait out the showing. Make sure you contact a friend during this time and let them know that if you don't call them back within the hour to check in on you. There are too many instances of real estate agents, buyers and sellers getting into trouble when they go alone. Whether you are a real estate agent, a buyer or a seller, there is safety in numbers. Make sure everyone has a cell phone or some instant form of communication and stick together during the showing instead of splitting up. You want to sell your home but you want the property to remain safe during showings while it's on the market. 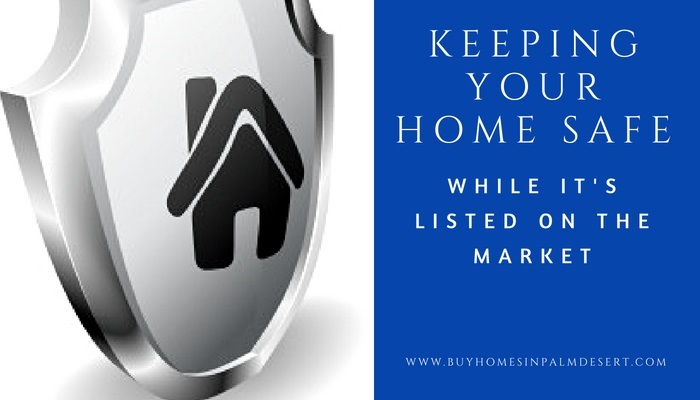 For more tips and to get your home listed today give me a call. I work the entire Palm Desert, Indio, LaQuinta and Palm Springs real estate area.